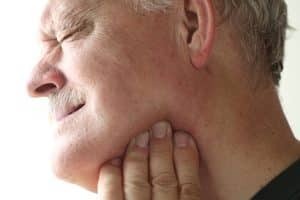 Temporomandibular joint dysfunction, sometimes abbreviated as TMD or TMJD, is an umbrella term that encompasses the pain and loss of function that can occur due to a problem with the jaw, its joints, muscles, or ligaments. TMJD can happen due to cartilage wear and tear, tooth problems, muscle strain or trigger points from overuse (for instance those who chew gum constantly, bite their fingernails, or constantly clench their jaw), erosion of the disc that sits within the joint, or jaw injury. Many times, it remains unclear what is causing the pain and problems. This can be even more frustrating for someone who is looking for relief and a solution to their condition. Your jaw bone, also called the mandible, connects with the skull on each side of your head. These joints are known as the temporomandibular joints, or TMJ because they connect the temporal bone of the skull with the mandible. These joints are located just in front of your ears on both sides of your face. The TMJs are among the most complex joints in your body. They allow for both hinging and gliding to accommodate for the movements necessary to be able to talk, eat, swallow, and yawn. Within the joint is an articular disc which separates the bones of the mandible and skull and helps to cushion the movements of the jaw. Several ligaments and muscles attach to the jaw and surrounding structures that provide stability and movement. Trauma – as is the case with any other bone in your body, your jaw can become injured, misaligned, or broken. A blow to the jaw, side of the head, or face (direct trauma) can cause swelling, bruising, pain, and can even cause the loss of some teeth. The jaw can also become injured indirectly in a whiplash-type injury where the neck snaps forward and backward forcibly. Healing from a jaw trauma can be challenging. Icing and eating soft foods through the healing process can make the pain more tolerable. Joint arthritis – the jaw, with its wide range of motion, can develop arthritic changes. The cartilage in the joint can wear thin and the articular disc can either wear or become displaced. Signs of joint arthritis can include stiffness, grating, and pain. Underlying disease process – these might be rarer causes of TMJ problems, but can still be a factor. Mumps causes swelling in the glands beside your jaw that can cause pain and limit your ability to open and close your mouth. Tetanus is also well known for causing lockjaw, which happens due to spasm of the muscles that control jaw movement. Dental problems – dental issues like having fillings, missing teeth, crooked teeth, impacted wisdom teeth, or a bad bite can all contribute to TMJ pain and dysfunction. Some dental procedures might require you to hold your jaw open for extended periods of time which can lead to jaw soreness and discomfort. Nighttime grinding – if you wake up in the morning with jaw pain or stiffness, you might be grinding your teeth at night without knowing it. Waking up with a dull headache can be another sign that your jaw is working overtime while you’re asleep. Another sign to look for (or that your dentist should be looking for) is worn-down teeth that look to be flattened on top. People who grind at night may be doing so because of high stress levels, missing teeth, or an improper bite. Poor posture – over the course of time, slouching and poor posture can contribute to increased stress on the jaw, an uneven bite, and TMJ dysfunction. Atlas misalignment – the atlas is the uppermost vertebra in your neck. It rests in very close proximity to the joints of your jaw on either side of your head. The atlas is responsible for holding up the weight of the head, and its movement is what allows for the freedom of movement of our head. Your atlas can shift out of alignment as a result of an injury (i.e. car or sports accident), or wear and tear (i.e. repetitive overuse). This can influence your posture, your neurological function, blood flow between the head and neck, as well as pressure on the jaw. When the atlas is off, it can lead to TMJ dysfunction. At Woolley Chiropractic Center, our focus is on upper cervical chiropractic care. This is a subspecialty within the chiropractic profession that addresses atlas misalignments in the most precise and gentle way possible. Atlas misalignments can be an underlying cause of many TMJ symptoms, and having a misaligned atlas corrected can lead to the relief of pain and inflammation, and the restoration of normal jaw movement and function. Many of our TMJ patients find that they experience relief once they have their atlas corrected and give their body the time it needs to heal and stabilize. If you haven’t had success with previous TMJ treatments or are looking for results that last, then contact us for an obligation-free and complimentary consultation to see if we can help.